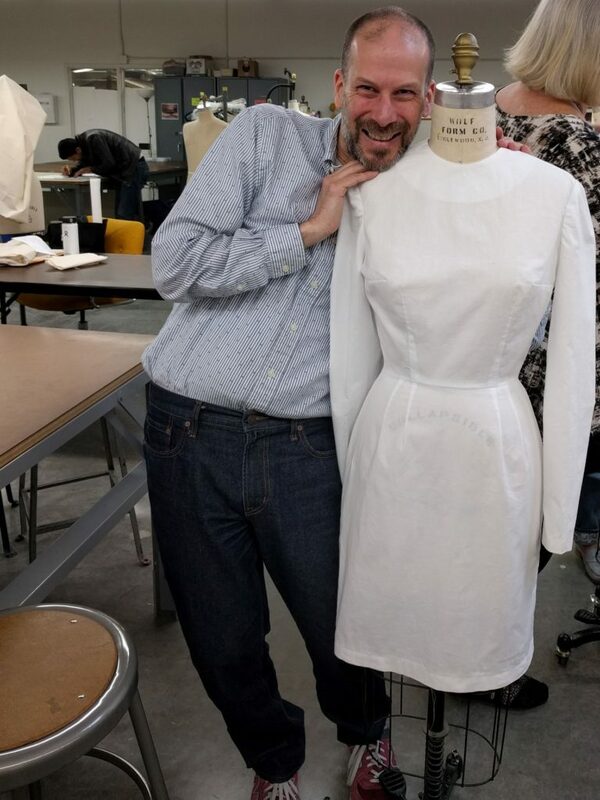 My personal sewing projects have ground to a halt, because of two classes I am currently taking at City College of San Francisco. But I am not complaining; both of them have been exciting and enriching. The Moulage is a class taught by Lynda Maynard. She is an expert in couture sewing and fitting techniques, and the author of two books: one on couture sewing techniques, and a self-published book on fit. She also has several Craftsy classes available, and I’ve just purchased her fitting class. Moulage is a pattern-drafting system that aims to produce a skin-tight garment that fits your torso from neckline to hip, based on measurements. I am told the word “moulage” translates from the French as “mold”, a way of molding a garment to your body. This entry was posted in Classes, Pattern Drafting on July 10, 2017 by mportuesisf. Please rest assured, this hasn’t (permanently) turned into a women’s sewing blog. I have a shirtmaking project in the works that I plan a big blog series about – if you want to see the sneak preview I’ve been posting pictures on my Instagram feed, @lineofselvage. 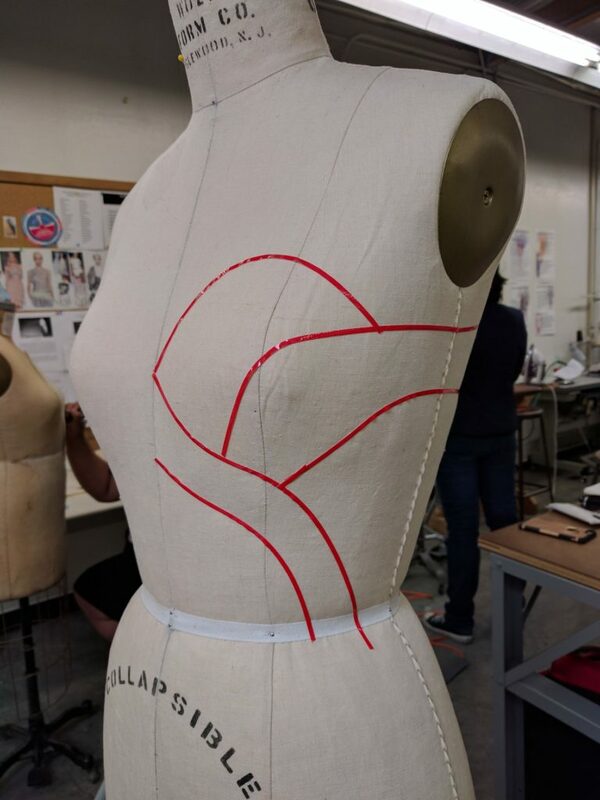 In the meantime, here’s an update on my progress in the Fashion Draping course I’m taking at City College of San Francisco. Since the midterm, we’ve done projects including draping flared skirts, dartless torsos, fitted torsos, and draping with knits. But two projects stand out. A bustier is a strapless bodice top that fits very closely to the body (though you can add a strap to it once draped). It is different from a corset in that the bustier sits right on the body, while a corset is actually smaller than the body. Ideally, the shaping in a bustier is accomplished by seams. Each seam provides a place where the fabric can be sculpted and shaped over the body. One requirement is that a seam of some sort crosses the bust point, or the apex of the bust. This allows for shaping of the bust area. We use draping tape to mark the style lines of the design. Each line becomes a seam in the bustier, and is also part of the design. Everyone was encouraged to make their own original design; mine had many style lines and curves. This entry was posted in Classes, Fashion and Style, Pattern Draping, Women's and tagged draping-class on May 4, 2017 by mportuesisf. 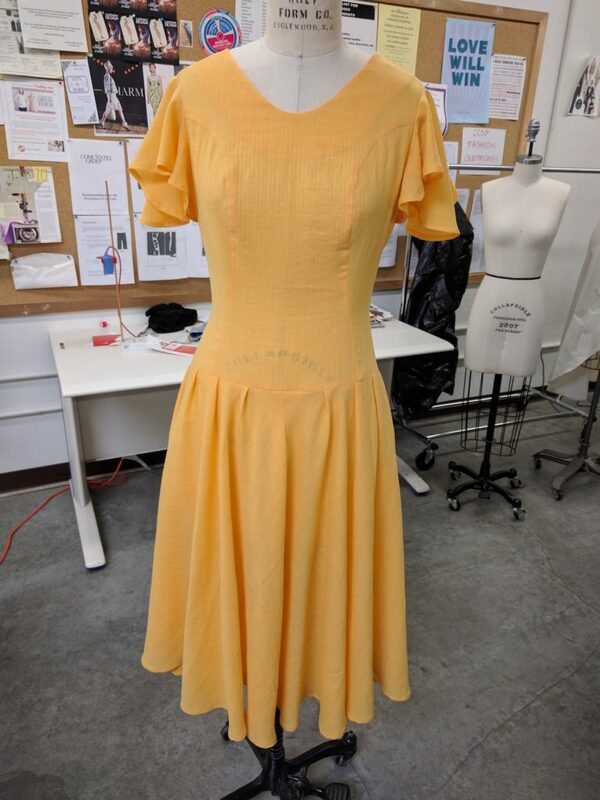 This is a men’s sewing blog – even the tagline claims “by men, for men”, but I have to stop and tell you all about the first dress I made in my Fashion Draping course! Doesn’t my dress form look sensational in her cotton broadcloth dress? She’s ready to wheel down the runway. This entry was posted in Classes, Fashion and Style, Pattern Draping, Women's and tagged draping-class on March 20, 2017 by mportuesisf.